Oh, no! Morris is DEAD? 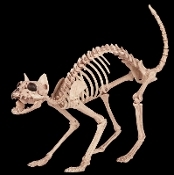 Life Size Realistic Creepy KITTY DEAD SKELETON CAT Prop Building Decoration. Feline ZOMBIE BONEZ the Hungry Skeletal Walking Dead inspired attack Cat is here to frighten unsuspecting guests at your Halloween costume party or Haunted House. Is he really bad luck, or was he just unlucky himself? We will never know. This ghostly animal spirit is a scary addition to any Pet Cemetery, Freak Show, or Witch den display. Hard Heavy Injection Plastic Bones with Movable mouth and adjustable bendable tail. Static prop figure, approx. 18-inch (45cm) Long X 5.5-inch (13.75cm) Wide X 10.25-inch (25.63cm) High.